Clipping Chix: Petsmart: Midwest iCrate Dog Crates only $9.99-$47.99! 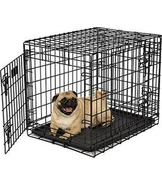 Petsmart: Midwest iCrate Dog Crates only $9.99-$47.99! Through tonight only, hurry on over to PetSmart.com where they are offering these highly rated Midwest iCrate Dog Crates for $9.99 to $47.99 (regularly $24.99 – $119.99). Plus, today only, shipping is free! As one idea, you can grab this Midwest iCrate 18″L x 12″W x 14″H for only $9.99 shipped to your door! Note that the free shipping ends tonight. Midwest iCrate 48"L x 30"W x 33"H is only $47.99 shipped!